ages you send out to the world. Whenever you send a tweet with your location information, users will see a map pin at the bottom of your message. Clicking on the pin reveals a Google Map with your location. How do I get Geotagging on Twitter? Geotagging is an opt-in service only. To turn it on go to your Twitter settings page on Twitter.com and click on "Enable geotagging" under the "Account" menu. How close is Twitter's Geotagging? 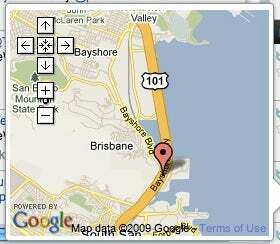 Geotagging in Twitter includes a link that marks your exact location on Google Maps. Is Geotagging all or nothing? It doesn't look like it. Twitter say it wants you to be able to selectively geotag your tweets. To that end, all third-party applications must be "upfront and obvious" when geotagging one of your posts. If you ever find that an application is not notifying you about sending out your location information, Twitter wants you to let them know. Who controls my location history? d period of time." However, Twitter did not specifically adress this issue in its announcement on Thursday. In fact, I got the distinct impression that all of your location data would be saved until you decided to erase it. Until Twitter clarifies this, it is probably best to assume that once you opt-in, all geotagged tweets will be saved until you delete your data. "Enable geotagging" will be a button labeled "Delete all location data." This deletes all historical location data from your tweets. Twitter warns this process could take up to 30 minutes. Be aware that if you decide to opt-out of geotagging later on, Twitter will not automatically erase your location information from past tweets. You have to erase it yourself. Another important thing to note is that Twitter says it cannot guarantee your location data will be scrubbed from all third-party applications when you delete it from Twitter.com. Be prepared for the possibility that some of your location data will always be out there regardless of how often you delete. Where can I use Twitter's geotagging? Currently, geotagging is available only on third-party clients, most of which are mobile applications. The new service will be coming to Twitter.com eventually, but not yet. If you want to try out the service, Twitter says applications ready for geotagging right now include Seesmic Web, Birdfeed, Foursquare, Gowalla, Twidroid, Twittelator Pro, and a few others. For the moment, it looks like you can only tweet location-based information from your smartphone. In my tests, I could not get geotagging to work on Seesmic Web; however, I could view the locations of others in the Web client. Since Twitter says the new location feature will be coming to its Website later on, you should eventually be able to embed location based information from your PC. Google's My Location for desktop does this based on surrounding wireless access points, Twitter's feature may do the same. To find out more about Twitter geotagging visit Twitter's support page.